The Mets are seeing significant trade interest in 26-year-old RHP Noah Syndergaard, SNY's Andy Martino reported on Friday, adding that a potential Syndergaard trade this offseason is a real possibility. My understanding, after talking to MLB insiders this past weekend, is that to move Syndergaard, the Mets would need to get back a comparable, elite position player able to help the team win in 2019. Along those lines, it would mean Brodie Van Wagnen getting back a position player projected to produce around 4.0 WAR and likely fill a current hole, such as third base, center field or catcher. In Syndergaard's best season, 2016, when he had a 2.60 ERA (2.29 FIP) and 1.14 WHIP while striking out 10.7 per 9 in 183.2 innings, he ended with 6.3 WAR and finished eighth in Cy Young Award voting. Since then, he has missed just over 50 percent of his potential starts across two seasons due to a lat muscle injury, shoulder pain, a finger ligament injury, and elbow pain. Insiders I surveyed believe Syndergaard will earn roughly $30 million the next three seasons, during which he is eligible for arbitration before being eligible for free agency after the 2021 season. There are close to a dozen teams looking to add a top-of-the-rotation starting pitcher. However, to get a potential ace with star power, under team control, in return for an equally productive position player, only a few of those teams fit Van Wagenen's narrow target. For instance, while the Padres may like Syndergaard, they really only have upper-level, top prospects to offer the Mets. The same can be said for the Pirates, White Sox, A's, Giants, Brewers and Red Sox, all of whom may or may not have solid, everyday big leaguers to offer. But most are not productive enough or are due to be free agents after the 2019 season. And, the players that do match up are guys these teams can't afford to lose. I'm sure the Astros are extra intrigued in Syndergaard because he's a native Texan and grew up idolizing Nolan Ryan, who is currently a special assistant to the organization. 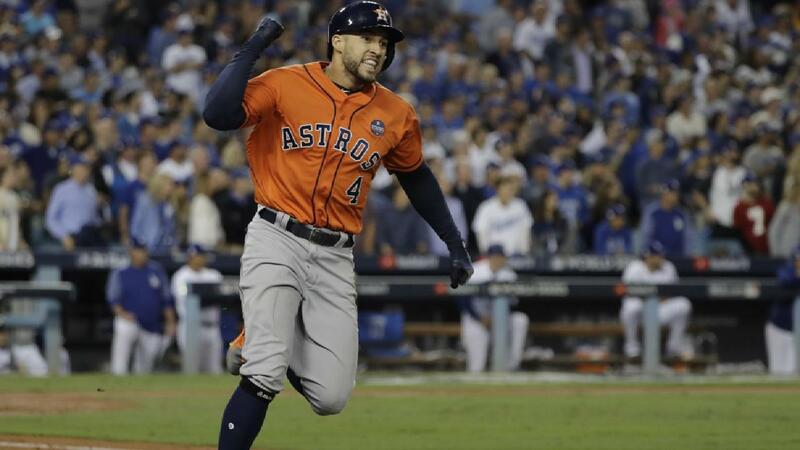 The Astros will not be thrilled with the idea of parting with either George Springer or Carlos Correa, but they each fit in perfectly as a one-for-one swap with Syndergaard. In Springer, the Mets would get a 3-4 WAR corner outfielder able to play center field. He's hit at least 20 home runs with at least a .340 OBP each of the past three seasons. He'll earn the league minimum this coming season, after which he's arbitration eligible through 2022. Or the Mets could ask for Correa, who had a down season in 2018, due mostly to injuries. Prior, he was an elite shortstop putting up 5.0 WAR in back-to-back seasons. At 24 years old, he's arbitration eligible through 2021, during which he'll likely earn the same amount of money as Syndergaard. Similar to dealing with the Yankees, the thought of Syndergaard dominating the NL East and the Mets in a Braves uniform the next three seasons is something Van Wagenen cannot take lightly. That said, the Braves have two sensational, young position players with minor leaguers ready to take over. In Ronald Acuna, the Mets would get a 20-year-old likely to put up at least 3.0 WAR and pick up 40 extra base hits with a .360 OBP. He can hit leadoff and has an average glove in center field, though he's a much better defender in left field. To get Acuna, who will earn the league minimum in 2019 and 2020 and isn't eligible to be a free agent until 2023, the Mets would almost certainly have to put more in the deal. Or, the Braves could give up Ozzie Albies, who is 21 years old, has an above average glove at second base, is fast, can hit leadoff, and puts the ball in play, which is something the Mets want to improve on next season. Similar to Acuna, Albies is not a free agent until 2023, which means -- again -- the Mets would need to include a top prospect to balance out the deal. In late October, ESPN's Buster Olney reported the Cubs were open to trading Kris Bryant, which led to a debate of whether it made sense to trade Syndergaard to Chicago for their All-Star third baseman. There have been no hard reports indicating the Cubs have interest in Syndergaard, but it's worth noting they repeatedly scouted him a few years ago when it seemed the two organizations were a natural fit to swap pitching for hitting. In Bryant, the Mets would get a potential cornerstone player at a position perfect for power. Bryant would also squash any fan and media pressure on Van Wagenen to sign Manny Machado, Bryce Harper, or Josh Donaldson. With Bryant in New York, and by solving their need for an ace by acquiring an affordable Syndergaard, the Cubs could more easily make a run at Harper or Machado as insiders expect they would like to do. Bryant, who is a 5-6 WAR player when healthy, is not a free agent until after 2021, which is the same year Syndergaard is free. He has also recently adjusted his approach at the plate to put the ball in play more than just going for lift and large home run totals. In addition to playing third base, he has spent time the past few seasons playing first base and corner outfield. And he has been an above average defender at each position. The Yankees were reportedly interested in Syndergaard and Jacob deGrom this past summer, according to multiple reports. The New York Dailyn News went so far as to put a picture on their back page of Syndergaard in a Yankees uniform, which nearly made me vomit. To get Syndergaard, the Yankees will need to overpay, because if Van Wagenen gets such a deal wrong and we are forced to watch Syndergaard thrive in the Bronx, heads will roll. In Andujar, the Mets would get a battle-tested, 24-year-old third baseman with MVP potential. Fangraphs has him projected to produce 2.7 WAR in 2019, during which he'll be earning the league minimum. He's arbitration eligible the following season through 2022. But the Yankees are not planning to pursue Syndergaard, according to Martino. The Angels want to get Mike Trout a World Championship. The clock is ticking and they need a young, controllable ace to help make it happen. However, 29-year-old Andrelton Simmons is the only player on their roster that is a reasonable fit in a swap for Syndergaard. Simmons, who is projected to be a 4.0 WAR player in 2019, is such a sensational shortstop in the field that he'd help Mickey Callaway's remaining starting pitchers in ways they can only dream about today. Zack Wheeler, who relies on the ground ball, could find himself in next year's Cy Young race with Simmons behind him. And, I can't even fathom how Simmons would make Jacob deGrom better than he was this past season. Oh, and he makes contact at the plate, is good for close to 40 doubles, can steal bases, rarely strikes out, has played in a large market and is due $13 million each of the next two seasons, after which he'll be a free agent. Due to Syndergaard having one extra year of control and Simmons not being the true impact bat the Mets desire, the Angels would need to include more. I'd push the Cubs to swap Syndergaard for Bryant. And, if they'd do it, I'd pull the trigger. The other above deals are enticing, specifically potential matches with the Braves and Astros, but I see too much risk in the players coming back to Queens, either because they don't have much track record or because I have questions about how such young kids will handle the move to playing in such a loud and frenzied market. Byrant, on the other hand, has played in a big market where he's won a World Series. He's conditioned for what he will face in New York, where expectations will be high considering he was dealt for the popular Syndergaard. The only other deal I'd make is to get Simmons and more from the Angels. It feels risky and probably is, but if the Mets could follow up losing Syndergaard with by signing a free agent, such as Patrick Corbin, Dallas Keuchel, or Nathan Eovaldi (as SNY's Andy Martino reported they're open to doing), I believe the benefit to having Simmons's glove behind these guys will have a noticeable effect on their production. In other words, not only would Simmons add the type of slap-hitting, constant-contact hitter the Mets need in the lineup, but his presence at shortstop would also make the starting pitchers better than they are already.